The Arturia iMini — look familiar? iMini features an arpeggiator, twin Kaoss pads and scale correction. It was surely only a matter of time before an iOS Minimoog appeared, and it's no surprise that Arturia are the company who've made it. It's called the iMini and its main page is a representation of the well-loved Model D panel, but with enhancements such as oscillator sync and (limited) polyphony. A second page contains an arpeggiator and twin X/Y pads, for Kaoss-like control over parameters of your choice, while the sparsely-populated FX page reveals just two effects: chorus and delay. Fortunately, they're all you'll need to play iMini straight from the box. Where to start? Well, the obvious place is with the factory presets, because over 500 are supplied, with legends such as Geoff Downes and Klaus Schulze contributing. It's an unexpectedly diverse resource, especially when you consider the interface involved, although the patches are compatible with Arturia's Mini V, so it's possible that some originated there. Regardless, that handful of knobs and switches leads to a wealth of tones that cry 'Minimoog' again and again. Arturia have mostly stayed faithful to tradition, but there are deviations. For example, a variable pulse-width control has been snuck in. It's 'revealed' by resting a finger on the Waveform selector until a knob appears. There's a minor omission too: the Minimoog's overload light. To create a feedback loop, you must first flip the External Input switch to its halfway position. This isn't quite the overdrive we know and love, but it's worth having all the same. Alternatively, iMini is compatible with Tabletop (the free audio-piping app), which is another means of re-routing audio, or sending it to other Tabletop effects. However, I found performance under Tabletop to be sluggish and user patches didn't show up — or mine didn't, at least. Actually, latency was noticeable even when running stand-alone, and became more obvious when I attempted to harness iMini's power for tight sequencing work. With luck, your sequencer will have a means of compensating for the delay (around 27ms on my iPad 2). Core MIDI and Wist are present and all knobs are freely assignable. Oh, and you're going to want to play it from a real keyboard! On a Model D, the range of the tuning knob is extended when you switch an oscillator to its 'Lo' range. It's baffling, therefore, that Arturia chose not to copy that behaviour. Instead, to adjust modulation speed you hold down VCO3's tuning control until a coarse tuning knob materialises next to it. The extra knob sets the modulation rate. Another oddity is the hiding of the glide and decay switches. These are discovered beneath a panel that flips over at a touch. The same flipping panel gives more goodies too: keyboard transposition, pitch-bend range and scale selection. Back in prog-rock days, a Minimoog player might have been judged on his ability to rattle off an Arabian scale at the drop of a semiquaver, but if you're using the on-screen keyboard, you might be glad of preset scales to steer you past wrong notes. Perhaps the least successful innovation is poly mode. It delivers three notes at best, but occasionally distorts. If you're partial to high notes and long releases, 'occasionally' could become 'regularly'. 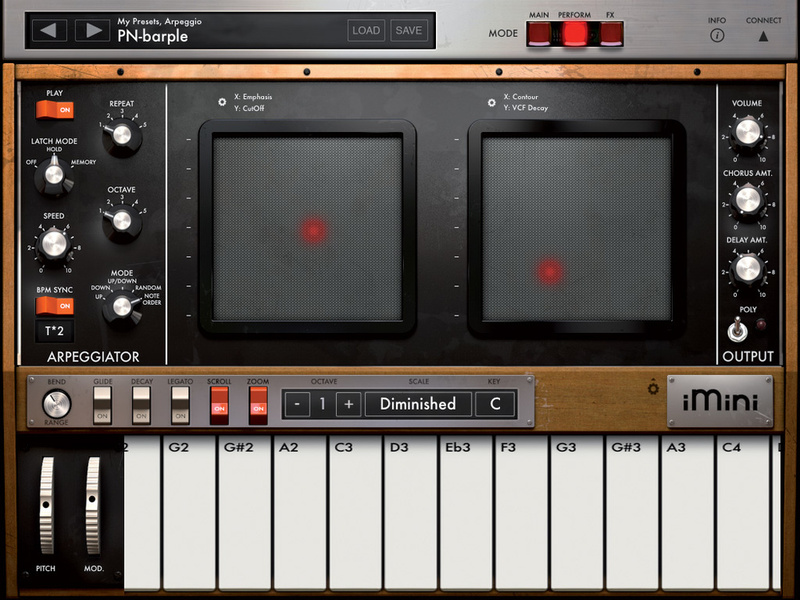 Even so, when used with care, this little app can sound tantalisingly like a polyphonic Minimoog. Maybe the occasional glitches will be modelling fodder for the future. Maybe I need a more powerful iPad! The Rode iXY sat proudly atop [actually it's sat proudly 'abottom' — Ed] an iPhone running the Rode Rec app. With the advent of iThings and apps came the expectation that pretty much anything you could run on them or plug into them would be cheap and cheerful. But to make the best possible use of their 24-bit, 96kHz recording capabilities, you need a good microphone, which is where the Rode iXY comes in. Built in Australia, the all-metal iXY comprises a pair of cardioid capacitor capsules in an X/Y configuration with 24-bit on-board A/D conversion, and is claimed to be the first professional-quality iOS stereo mic. It comes with a protective zip-up pouch and windshield and offers plug-and-play operation with Rode's own Rode Rec or Rode Rec LE apps. The mic is also compatible with many other software recording apps, but 24/96 recording is only possible using Rode Rec. As Rode Rec LE is free and Rode Rec costs just £3.99$5.99, there's little point in using anything else. These both allow adjustment of the mic gain and of headphone monitor level, though the full version also offers a parametric EQ, compressor, expander, multiple file-format export facilities supporting Dropbox and Soundcloud, a wider choice of sample rates, and audio editing facilities such as cropping and looping. It also boasts 15 iZotope input processing presets, metadata capability and variable playback speeds, so at slightly more than the cost of a pint it's probably worth having! For straightforward recording, though, the LE version works just fine and saves each recording as a separate file. 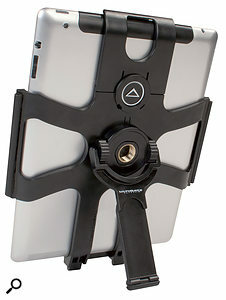 Rode's iXY is currently compatible with the iPhone 4S, iPhone 4, iPads up to and including the iPad 3 and the iPod Touch 4, but not with any device sporting the new Lightning connector. However, an updated iPhone 5-compatible model is planned for the near future, with a paid upgrade path for users wishing to change at a later date. Alternatively, I'm told that an Apple video adaptor also works. Offering a full 20Hz to 20kHz frequency range, and tolerant to SPLs of up to 120dB, the mics are specified with a sensitivity of -42dB ref. 1 Volt/Pascal (8.52mV at 94dB SPL) +/- 3dB at 1kHz. Power is provided by the connected iOS device. The weight of the mic array is 40 grammes and it measures 46 x 55 x 40mm. An LED indicator shows green when the iXY is connected. The Ultimate Support HyperPad. The topmost section can be removed to allow you to insert your iPad. 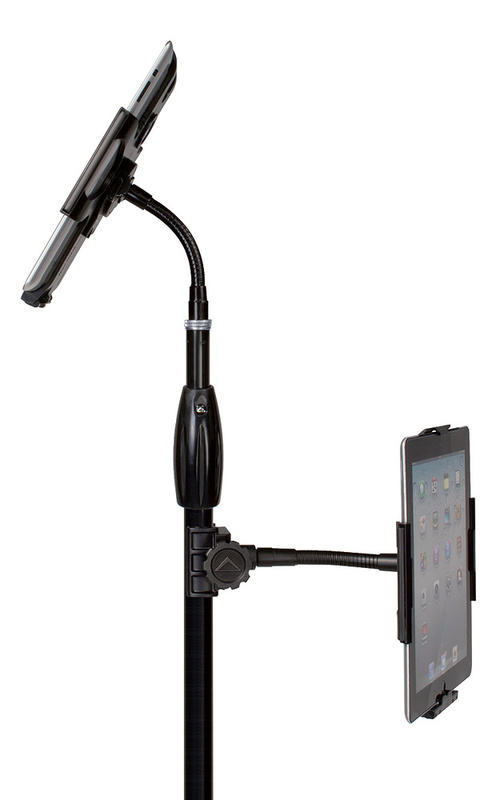 Make your own iPad tree: The HyperPad can be attached to a mic stand in several different way. Apple's iPad seems to have wormed its way into both live and recorded music in a big way, so having some way to hold the thing securely in the right position is a must. The problem is that the right position varies depending on the task in hand, which is why Ultimate Support have developed the Hyperpad. Designed for all full-size iPads, the HyperPad offers five different mounting configurations that should cover the vast majority of situations. This is achieved by the provision of different mounting attachments that can be fixed to the plastic frame that holds the iPad. The package comes with a short gooseneck (5/8-inch thread) that can screw directly onto a mic stand or onto the included desktop clamp (0.5 to 1.6 inches desktop thickness), and also with a fitting that clamps to the tube of a mic stand with a diameter from 0.8 to 1.25 inches. Additionally, a fold-out support on the back of the stand allows for 'photo frame'-style desktop display without requiring any of the additional fittings. This can be rotated for either portrait or landscape operation. Although, with the exception of the threaded mountings and tightening screws, the device is almost entirely made from heavy-duty plastic, it is extremely tough and very cleverly designed. Your iPad will have to be removed from any third-party case you may have put it in, and to mount the iPad, a section of the stand is removed and then clicked back into place once the iPad is installed. There's an aperture to allow the connector to pass through unimpeded, and even a couple of tiny swivel rubber feet to add stability when using the portrait free-standing mode. While the typical street price of around £60$70 may initially seem a bit steep, once you examine the build quality and design ingenuity of the system, it actually seems like very good value. Both the table clamp and mic-stand clamps are very substantial. The mic-stand mount can screw directly to the back of the iPad mount or be connected via the included short gooseneck for angled use. Goosenecks are notorious for not staying where you put them, but this one is reassuringly stiff. In fact, I'd say the only trick the designers have missed is in restricting the pole clamp travel so that it won't go wide enough to fix to speaker poles, as I feel that would have been a useful option in some situations, especially at cramped pub venues. The desk clip will fit a speaker pole and is reasonably secure, but as it has flat sides it doesn't grip as well as the proper pole mount. Drum Loops HD lets you audition drum loops and then copy them to your DAW. Available as an iPad, iPhone or iPad Touch app, Drum Loops HD is essentially a library of very nicely recorded, stereo, 16-bit/44.1kHz drum loops, fills and endings. These can be copied and pasted into any DAW that supports copy and paste, or simply used to play along to instead of a metronome. The drum parts were recorded live by Hans Eijkenaar at Sound Vision Studios in Arnhem using all the best toys, and the resulting rhythmic loops have been trimmed so that they will loop seamlessly in your DAW. 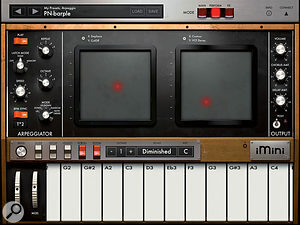 A number of different musical styles are catered for, and each style section contains loops in two versions: modern miking, with 14 mics around the kit, or vintage style, using only five mics. The styles on offer include Ballads, Pop/Rock, Funk/Hip Hop, Dance/DnB, Brushes, Jazz and Tom Loops, and also individual drum hit samples from the pop and jazz kits. There's also an endings section comprising cymbal crashes, cymbal rolls and so on. The different styles are supplied with a choice of tempos; Ballads, for example, provides five different rhythmic loops plus three fills recorded at 60, 66, 72 and 78 bpm, although some sections have more tempo options than others. As these are all audio recordings, the only way to change the tempos given is to either use a time-stretching algorithm or to convert them to Apple Loops. Navigating around the App is easy. The first choice to make is the style. Once you're on the right page, there are audition buttons for all the samples, with a Stop button next to each. You have to press Stop before you can audition another loop or fill, but you can use any of the Stop buttons on the page, regardless of which loop is playing. Loops of the same tempo are displayed on a single iPad page, and you simply swipe to scroll down to find the same loops at alternative tempos. Each loop and fill has a Copy to Pasteboard button next to it, so when you find the ones you want, you can copy them, open your DAW and then paste them before moving them into place.